With industry-leading 10.0 cu. ft. total capacity (5.0 cu. 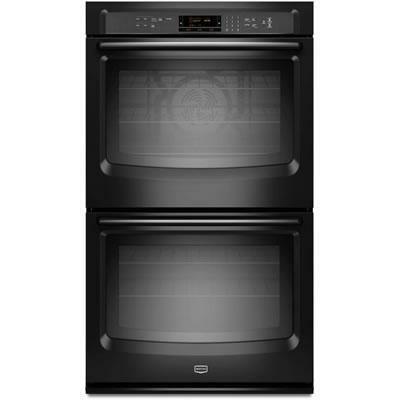 ft. Upper/Lower) and a 10-year limited parts warranty on the elements, this built-in 30" double oven is made to last. Easily check on advanced features like 8-minute Power Preheat or EvenAir™ true convection using the 4.3" LCD screen. The innovative new FIT system installs in your existing opening without any cutting or extra wood trim+. For a stylishly simple way to monitor your food, the panoramic view windows offer a large viewing area. Additional Information Industry-leading 10.0 cu. ft. Total Capacity (5.0 cu. ft. Upper/Lower); Power Preheat your oven in 8 minutes; Delay-Start oven control; Precision Cooking™ System with Precise Preheat, PreciseBake and PreciseBroil; Variable Broil; Standard Oven Racks: 2 Upper / 2 Lower; Keep Warm™ Oven Setting; EvenAir™ True Convection with Third Element and Auto Conversion; FIT System offering Streamlined Installation; Panoramic View Oven Window; Heavy Duty Roll-Out Rack; 4.3" LCD Touchscreen Oven Control; Self-Cleaning Oven with Adjustable Cleaning Levels; Hidden Bake Element; Cabinet Installation.